What Makes Cast Iron Doorstops Valuable and Desirable? Doorstops are simply heavy objects used to hold a door open. Until the late Renaissance, rocks or bricks were used for this purpose. By the late 1700s, however, many homes utilized round, decorative examples made of sand-cast brass, or other types of metal with flat, hollow backs, according to an Antique Trader cover feature by Melody Amsel-Arieli. By the early 19th century, the first French and English homes employed iron doorstops in a bevy of shapes. Some of these, says Amsel-Arieli, were called door porters and they came with long handles used to lift and place these heavy objects. When found in pairs, it's safe to assume doorstops were used to hold double doors open. They can be matching or in complimentary pairs like Punch and Judy, for example. The value of these sets, as with other cast iron doorstops, lies in the condition and the theme. Decorative doorstops weren’t widely used in American homes until after the Civil War, and most post-Civil War doorstops were small and lightweight. Decorative iron doorstops came into their own in the United States in the 1920s, and they remained very popular through the early 1940s when heavy metal rationing began during World War II. They were purchased very inexpensively, sometimes with coordinating door knockers or bookends, in gift shops, and even through mail order catalogs. Some collectors look for manufacturer's names, such as Hubley, on doorstops. This very popular maker of doorstops did a series of dogs and other detailed subjects; collectors love to find these in their original condition. Many other decorative doorstops are stamped with foundry names such as Albany, Wilton, and National. The most common way to collect these cast iron objects, however, is by theme. Entire collections can be built around cats and other animals, sports themes, Art Deco styles, and a host of others. “Doorstops that feature outstanding sculptural quality, form, and character are the most desirable of all. If they also bear identifying stamps, signatures, copyrights, studio names or production numbers (which often appear on their backs), their value rises even further,” said Amsel-Arieli. Focusing on condition, which “determines their ultimate worth,” leads avid collectors to buy antique and vintage doorstops in the best condition they can afford. Doorstops in good condition have their original paint, show minimal wear, and have little or no pitting or rust. Rare and unusual examples in excellent to mint condition can be worth thousands. 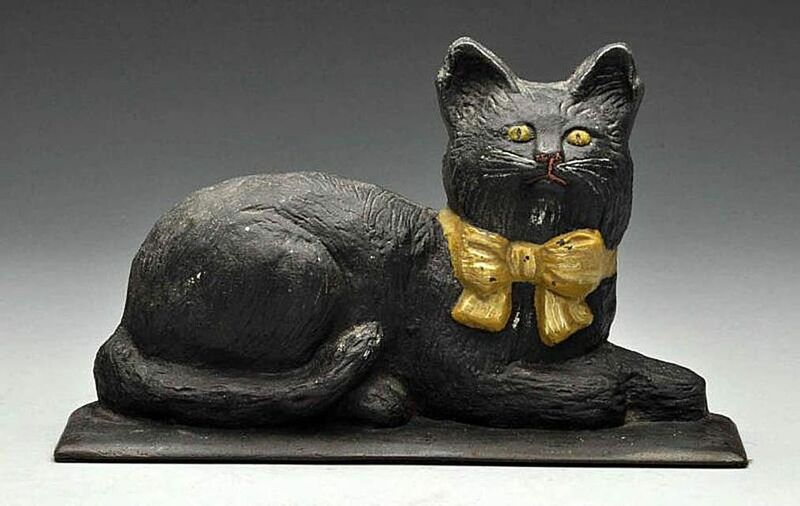 A poor version of the same doorstop (or a reproduction) isn’t worthless but will bring considerably less and will not rise in value as readily over time. Be aware that most doorstops will fall short of “mint” condition. They were made to be used in homes, and the paint often chipped as a result. When they fell out of favor as decorative accessories, many were banished to barns and garages where they deteriorated even further. Some were repainted over time as well. “Because doorstops are cast objects … they lend themselves to reproduction,” noted Amsel-Arieli in her Antique Trader feature. She also reminds potential collectors that molds have been reused and new designs have been developed over the years as doorstop prices have steadily gone up in the collectors' marketplace. It's fairly easy to tell reproductions from originals, even if you're not a veteran collector. Older doorstops usually have a smoother finish since they were hand finished with files when they were first made. New doorstops are made with power tools and have a rougher finish in comparison. Also look for Philips-head screws in two-part reproductions. Older versions will have slotted screws or rivets holding them together. And, many times newer versions will be slightly off in size compared to an older counterpart. Wear patterns can also be an indicator of age. Again, because these items were used for a particular purpose, they usually show wear on the bottom where they scooted along the floor or on the tops were they were handled repeatedly. Artificial aging can be added to new doorstops in terms of the way the paint looks, but again, they paint will rarely be in mint condition on an old example.